Born on July 11, 1838, in Philadelphia County, John was the son of Nelson Wanamaker, a bricklayer, and Elizabeth Kochersperger, a descendant of a family that had originally emigrated from France. He attended the Landreth Public School until he was 14, when he was employed as an errand boy in the publishing house of Troutman and Hayes on Market Street below Fifth at a salary of $1.25 a week. Sometime after this, his family moved to Indiana but returned to Philadelphia in 1856. John then became employed in the retail clothing store of Barclay Lippencott on the corner of Fourth and Market Streets at a salary of $2.50 a week. He left there for a better position with Joseph M. Bennett, proprietor of the Tower Hall Clothing Store which was, at that time, the largest business of its kind in Philadelphia. In later years, Mr. Bennett delighted in telling his friends: "John was the most ambitious boy I ever saw. We used to go to lunch together and he would tell me how he was going to be a great merchant. He seemed to be a natural born organizer; always organizing something. These are the things which probably account for his great success as a merchant now." A schoolmate of his once said that when any difficult problem was to be solved, it was the rule to remain after school hours. Many times the schoolmaster would become weary, but John was not so easily discouraged. He would keep the schoolmaster until the problem was solved to his complete satisfaction. Through this perseverance, he quickly outdistanced the rest of his classmates. While in school, he had little time for the recreation other boys enjoyed, for he had to work in his father's brickyard "turning up" bricks. This close application to both studies and work caused him to grow tall and thin; and this same concentration in his early employment severely affected his health. In 1858, he went to Minnesota at the suggestion of a physician. Here his health improved so rapidly that he was able to return to Philadelphia in the same year. Upon his return, he was elected the first salaried secretary of the Young Men's Christian Association (YMCA), which led to a lifelong interest in the national and international activities of this great organization. At the outbreak of the Civil War, he tried to enlist in the Army but was rejected because of a lung condition. With George H. Stuart and others, he then organized the "Christian Commission" to aid the sick wounded soldiers on both sides of the war. On April 8, 1861, three days before the shelling of Fort Sumter, young Wanamaker opened a small clothing store at the southeast corner of Sixth and Market Streets. Nathan Brown, whose sister he married about this time, was his associate in the enterprise. That store, near the present-day Liberty Bell pavilion, stood on the site of the house where George Washington had resided during his two Presidential terms in Philadelphia. The outlook for the new business was not very encouraging. The sales for the first day were only $24.67; and the total sales for the first year were less than $25,000. 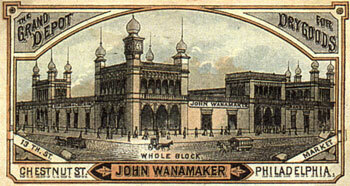 However, the first eight years were marked by the same spirit of close application with which John Wanamaker had approached everything from the time of his early youth, and his unbounded energy and unceasing devotion to all the details of the business caused it to develop and grow until it became the largest retail clothing establishment in America. In October of 1871, Wanamaker inaugurated the "one price" system, and its subsequent success became an incentive to other merchants throughout the country to follow his leadership. He also inaugurated the "goods returned and money refunded" principle in retailing. From the first he stood for truth in advertising, one of his first four cardinal business principles being "Accuracy in Word and Print." Wanamaker advertising copy and Wanamaker retail policies have proved to be most potent factors in the rise of department store ethics and procedures. In 1875, he bought the old freight station of the Pennsylvania Railroad at the corner of Thirteenth and Market Streets, and decorated the building exterior to resemble the pavilions of the Centennial Exposition then taking place in nearby Fairmount Park. Helped by the influx of tourists, Wanamaker's "Grand Depot" did a huge business its first year of operation. On March 12, 1877, he opened "The New Kind of Store," adding to his original stocks of men's and boys' clothing, women's fashions and merchandise for the home. He was the first to organize the vast store into departments and call them "departments". (Hence was born the term "department store".) This new business grew enormously until the entire block from Market to Chestnut Street and from Thirteenth Street to City Hall Square was gradually absorbed; and John Wanamaker became the owner of the largest retail store in America, if not in the world. The old freight station was subsequently torn down and upon its site now stands a magnificent twelve story granite structure designed by Chicago architect Daniel Hudson Burnham. In September of 1896, the A.T. Stewart Store, located on Broadway between Ninth and Tenth Streets in New York City, was added to the John Wanamaker enterprises; and in September of 1907, a fourteen-story building was erected on Broadway between Eighth and Ninth Streets adjacent to the original Stewart building, both buildings housing the main Wanamaker business in New York. John Wanamaker loved music, believed in its civic significance, and looked upon his great stores as a means of spreading musical inspiration and enjoyment in line with his own practical idealism. In 1909 he purchased the great Louisiana Purchase Exposition Organ and installed it in the Grand Court of his Philadelphia store. Imposing pipe organs also graced the Philadelphia store auditoriums and the Wanamaker New York emporium, and special concerts were frequently given for customers. Wanamaker was not only the founder and organizer of this outstanding mercantile achievement, but from the very beginning he devoted much of his time to personal direction and general detail. With all of his many other duties, however, he never neglected the duties of citizenship. He served eight years as President of the Young Men's Christian Association; was a member and longest survivor of the Board of Finance of the Philadelphia Centennial Exposition in 1876 and aided materially in raising the first million dollars needed to stage it. For several years he was director of the Philadelphia and Reading Railway Company. He assisted in funding the Presbyterian Hospital of which he was a trustee; and with Mrs. Wanamaker built the Children's Ward of that institution. For some years, he was manager of the University Hospital. He had a great interest in the Archaeological Collections of the Museum of the University of Pennsylvania, of which he was Vice President, and made extensive contributions to it. In 1916, under the auspices of the University Museum, Wanamaker financed an expedition to Alaska, for the purpose of studying the manners and customs of the natives, and to procure specimens of their work, and a knowledge of their history. He acted as chairman of the Citizens Relief Committee, to aid the Irish Famine Sufferers; to assist the Southern people at the time of the Yellow Fever scourge; and to help the Ohio River Flood sufferers. He assisted in sending from the port of Philadelphia a shipload of provisions to Russia at the time of the great famine there. In 1914, it was John Wanamaker again who instigated the shipment of food to the starving Belgians. 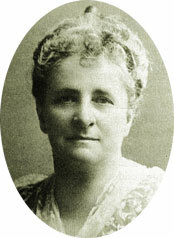 A Republican in politics, Wanamaker was a member of the Union League. He served as chairman of the committee that elected General Benjamin Harrison to the Presidency. Up until this time he had declined many invitations to public office, but when President Harrison nominated him Postmaster General, he accepted the post. During the four years of his incumbency, he introduced into the Post Office Department, many improvements. Outstanding among these were: Sea Post Offices; abolishing the Lottery; establishing commemorative stamps; enlarging Free Delivery, and establishing Rural Delivery. He organized the entire Postal Service of the Pacific Slope, and largely increased the mailing facilities for cities in remote sections of the country. 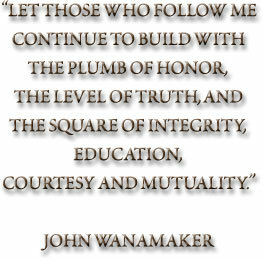 Wanamaker was vitally interested in the development of American shipping and did much to increase the building of ships to carry the American flag to ports all over the world. He lived to see many of the policies he had recommended while Postmaster General put into active operation, most of which are still in use today. 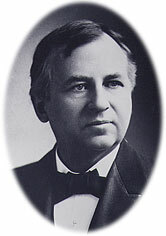 Wanamaker was a delegate to the Republican National Convention in 1912, and his name was frequently mentioned in connection with the Vice Presidency. 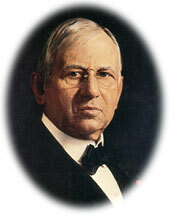 He was again a delegate to the Republican Convention in 1916, and nominated Charles Fairbanks to the Vice Presidency. In the campaign of 1920 he was named a Republican presidential elector. 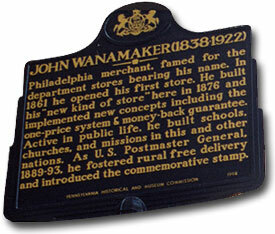 Early in his life John Wanamaker became a member of the First Independent Church at Broad and Sansom Streets of which John Chambers was pastor. He was always greatly interested in religious affairs. The most widely known religious enterprise connected with his name was undoubtedly Bethany Presbyterian Church. The little Sunday School, which he started in 1858, grew to be a large and active church, a famous Sunday School that became one of the world's largest Sunday schools and a group of other institutions that have attracted worldwide attention. In August, 1888, he opened in the Book Room of the Bethany Sunday School, the First Penny Savings Bank for the encouragement of young people, accepting deposits of one cent and upwards. In a few months, he purchased a house at Twenty-first and Bainbridge Streets and altered it to meet the needs of a banking establishment. By January, 1923, the little bank's depositors had grown to 46,157, and the deposits amounted to $11,572,388. This institution eventually merged with the Western Savings Fund Society. He was interested for many years in the work of foreign missions: The Allahabad (India) Christian College and the Mary Wanamaker High School for Girls. He erected YMCA buildings in Madras, India; Seoul, Korea; Kyoto, Japan; Peking, China; Calcutta, India; and a school in Beirut, Lebanon. He also gave generously to numerous other missions and YMCAs. In 1912, John Wanamaker received the decoration of an officer in the French Legion of Honor. Among the many other offices he held were the Presidency of the World's Sunday School Association and the Pennsylvania State Sabbath School Association. 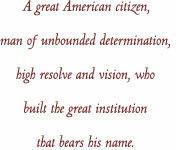 On April 26, 1921, a great honor was bestowed upon him, in commemoration of his sixty years in business life. In a ceremony at Independence Hall, he was presented with "the freedom of the city," and after the ceremony, the Mayor and a number of distinguished Philadelphians gave a luncheon for him. The Justices of the Supreme Court of Pennsylvania adjourned to attend the ceremony in a body. Congratulatory letters from the President and Vice President of the United States, the Governor of Pennsylvania and many others were read, and a resolution of congratulations was adopted by the Legislature. Among the outstanding tributes of the day was a message and gift from the Emperor and Empress of Japan. 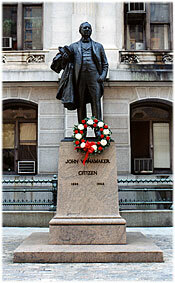 Every detail of the day's celebration showed the high place which John Wanamaker was held in the hearts of his fellow citizens in every walk of life. Mr. Wanamaker was taken ill in September, 1922, with a heavy cold, from which he never entirely recovered. He died on December 12, 1922, and was buried two days after his death from the Bethany Presbyterian Church to which he had devoted so many years of his life. Together with his wife and sons, his body rests in a stately mausoleum-bell tower at the Philadelphia church of St. James the Less in Fairmount Park. 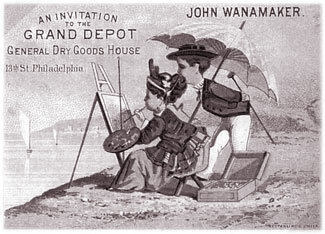 John Wanamaker's loss was so deeply felt that on the day of his funeral businesses throughout Philadelphia and even in nearby Wilmington shut down for all or part of the day. Fifteen thousand people, many clutching handkerchiefs, solemnly filed past his bier, and it was said that no other funeral in memory had attracted such a crowd. The heritage of the inspired life of this great man lives on in the large stone buildings that formed the core of his Philadelphia and New York retail empire as well as in the hearts of those who attempt to follow in his footsteps.